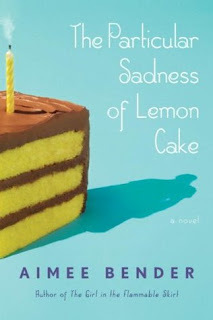 Goodreads: On the eve of her ninth birthday, unassuming Rose Edelstein bites into her mother's homemade lemon-chocolate cake and discovers she has a magical gift: she can taste her mother's emotions in the slice. To her horror, she finds that her cheerful mother tastes of despair. Soon, she's privy to secret knowledge that most families keep hidden: her father's detachment, her mother's transgression, her brother's increasing retreat from the world. But there are some family secrets that even her cursed taste buds can't discern. Kritters Thoughts: At the beginning I thought this was a great book with a little supernatural to it due to the little girl's ability to taste the feelings that the person cooking has while they are making what she eats. What started with an interesting tale of a very dysfunctional family went downhill fast. I still don't know what "special skills" her brother had and there were quite a few bits that I just didn't get, so maybe others could enjoy the dysfunction in this one - instead I was lost in it all. I felt the exact same way when I read it. The first 40 pages I was so excited thinking that it was going to be a marvelous book....it was such a letdown! This was an unusual read.